There are many factors that determine how long a case of kennel cough will last. While some cases resolve quickly without medication, other cases are more serious and last longer. You can help your dog recover more quickly by learning how to recognize the signs of a potential complication. According to Pet Education.com, a dog may be sick for about ten days once symptoms appear. However, each case of kennel cough is unique, and your dog's infection may last for a shorter or longer period than average. Dog health: A healthy dog has the best chance of recovering quickly. Dogs with weak immune systems or other health conditions, such as a collapsing trachea, may be susceptible to secondary infections. Age of the dog: A young dog may fight off the infection easier than a more mature dog. 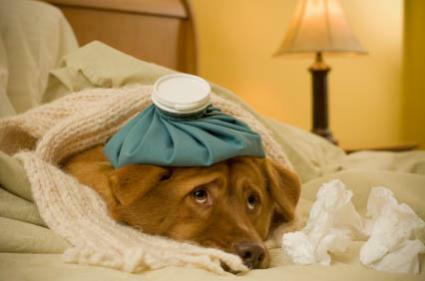 Type of infection: A dog may recover from some viral forms of the infection quickly without medication. However, he still may have a lingering bacterial infection that requires antibiotics to resolve it over an extended period of time. Secondary infections: Sometimes a secondary infection occurs, in addition to kennel cough, that results in a serious upper respiratory infection. A case of kennel cough with a secondary infection usually takes longer to resolve than one without complications. Once a dog is exposed to the airborne infection, the pathogens invade the body and disrupt the normal function of the respiratory system. Over a three to ten day incubation period, the pathogens temporarily destroy the protective cilia lining of the larynx, trachea and bronchi. Without the protective lining, the pathogens may also move into the lungs and trigger a secondary infection in some dogs. Small breeds, puppies, dogs with weak immune systems and dogs with pre-existing health conditions such as chronic bronchitis are even more susceptible to developing a secondary infection. The most common secondary infection is pneumonia. According to Pet Education.com, cases of kennel cough with a secondary infection can last between two weeks to nearly one month, perhaps longer without medical intervention. If you suspect that your dog has kennel cough, it is a good idea to consult a veterinarian as soon as possible. Early treatment, including the use of antibiotics, a decongestant or bronchodilators, may be necessary to speed your dog's recovery and prevent a secondary infection from prolonging your pet's illness.